Create a directory "deps" in pyprotect root directory. Download pybind11 project into the newly created deps directory. Unzip pybind11 zip file, and change the extracted directory's name from something like "pybind11-x.x.x" to "pybind11"
And you can find libpyprotect.cpython-PYVERSION-PLATFORM.so in the objs directory. SCRIPTS_DIR is your python project root directory. ENTRY_POINT_LIST is a comma separated list of file function pair which is directly ran as the entry point of your programme. OUTPUT_DIR is the destination directory to store the encrypted python scripts. EXCLUDED_SCRIPT_LIST is a comma separated list of python scripts which you don't wan to encrypt. You need to put libpyprotect.cpython-PYVERSION-PLATFORM.so into the OUTPUT_DIR as part of your programme. For security reason you should change the AES key and IV, which is used to encrypt/decrypt the python scripts, to a stronger value. 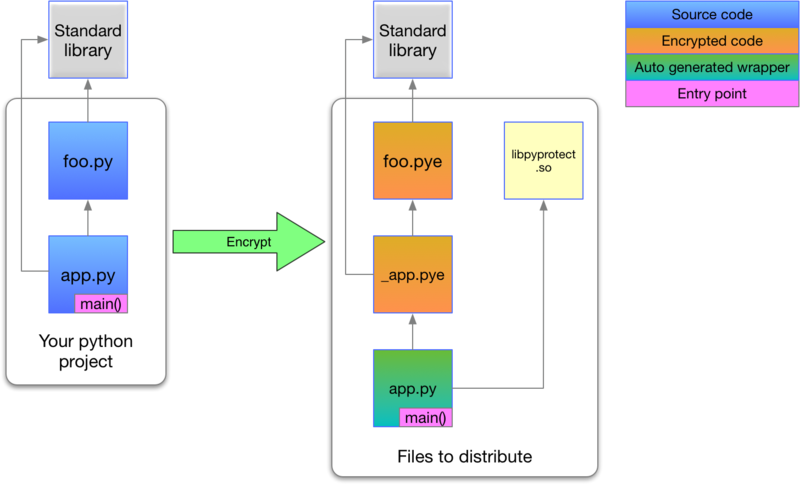 And you may want to change the file extension of encrypted python scripts (which is ".pye" by default). You need to change the two files both. Please change the PYPROTECT_KEY and PYPROTECT_IV to a safer value. ESPnet is an end-to-end speech processing toolkit, mainly focuses on end-to-end speech recognition, and end-to-end text-to-speech.